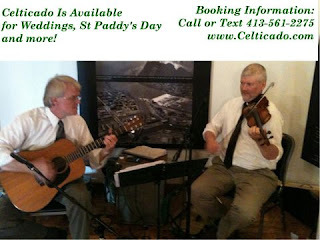 Celticado: Celticado is the culmination from among the top musical talent in western Massachusetts. Celticado is the culmination from among the top musical talent in western Massachusetts. Inspired by great Celtic music, Celticado's driven pursuit of melody interwoven by rhythm results in breathtaking arrangements that stir the soul and free the mind! Celticado is the culmination from among the top musical talent in western Massachusetts. Founding members Adam R Sweet (of Woodkerne, Crossing The Pond, Maple Ridge, Swift River, Sweet Blend, Backwoods Medicine) - fiddle, mandolin, guitar and bouzouki - contributes a stellar sound with a fantastic skirling style. Guitarist Jim Bunting brings a rich heritage of improvisation and American cultural roots to this great mix. On guitar, he lays the foundation with a solid backbone. Celticado is known for its traditional acoustic Celtic music, featuring fiddle, mandolin, Irish bouzouki and guitar, sets can include traditional Irish tunes by Turloch O'Carolan and others, Scottish, Welsh, French Canadian, Nova Scotian and New England Contra; as well as folk songs from the great American Folk history - many of them with roots in Irish and Scottish folk music. Celticado is also known for its Bluegrass and Americana sets featuring bluegrass fiddle, mandolin, banjo and flatpicking guitar. The band can assemble any number of members to satisfy any bluegrass event. We are prepared with hours of lovely acoustic traditional music for any wedding, party, concert, festival or special event.